Paris Air Show, FRANCE – Qatar Airways today announced an order for nine Boeing 777 passenger aircraft on the opening day of the Paris Air Show. The additional aircraft will help the airline open up new routes and add capacity to existing markets in its rapidly-growing network. The airline’s outstanding order for seven Boeing 777s will increase to 16 – and boost its current fleet of 35 triple sevens to 51 aircraft. Today’s announcement is for the 777-300 ER (Extended Range) version of the aircraft. Addressing media at a press conference at Le Bourget, venue of the Paris Air Show, Qatar Airways Chief Executive Officer Akbar Al Baker said: “With its reliability, economics and range capability, the 777 will continue to play a key role in enabling Qatar Airways to operate more direct non-stop flights from our hub in Doha to destinations in many markets including Australasia and the United States. 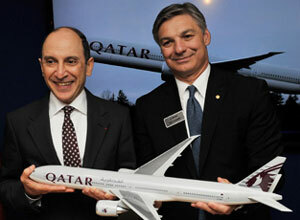 Qatar Airways Chief Executive Officer Akbar Al Baker, pictured left, at a press conference on the opening day of the Paris Air Show today with Boeing Commercial Airplanes President and CEO Ray Conner as the airline announced an order for nine new Boeing 777 aircraft. “We have already shown a desire to open up new destinations in the US and the Boeing 777 will further feature in our expansion plans in this part of the world, in addition to increasing frequency to other destinations. Of the current 777 fleet, Qatar Airways operates a mix of passenger and cargo aircraft – 22 Boeing 777-300ERs, nine 777-200LRs (Long Range) and four Boeing 777 freighters, with a fifth cargo plane set to be delivered to the airline this month. Qatar Airways CEO Akbar Al Baker is is pictured signing an order for nine Boeing 777 aircraft at a press conference on the opening day of the Paris Air Show. Qatar Airways Chief Executive Officer Akbar Al Baker, left, with Boeing Commercial Airplanes President and CEO Ray Conner celebrating a new order by the airline for nine new Boeing 777 aircraft. The Paris Air Show, held every two years, is one of the world’s largest aerospace events taking place at Le Bourget, a private jet business aviation airport on the outskirts of the French capital Paris. Qatar Airways has its newest aircraft, a 787 Dreamliner, on static display at Le Bourget having flown yesterday direct from Boeing's assembly plant in Seattle to make its French debut at the Paris Air Show. The new addition takes the carrier's Dreamliners up to six aircraft. The week-long event has attracted over 2,000 exhibitors from around the world with tens of thousands of visitors expected to attend during the trade and public days. One of the fastest growing airlines in the world, Qatar Airways has seen rapid growth in just 16 years of operations, currently flying a modern fleet of 125 aircraft to 128 key business and leisure destinations across Europe, Middle East, Africa, Asia Pacific and The Americas. Qatar Airways has so far launched six destinations this year – Gassim (Saudi Arabia), Najaf (Iraq), Phnom Penh (Cambodia), Chicago (USA), Salalah (Oman) and Basra (Iraq) – the latter started earlier this month. Over the next few months, the network will expand with the addition of further destinations – Sulaymaniyah, Iraq (August 20), Chengdu, China (September 3), Addis Ababa, Ethiopia (September 18), Clark International Airport, Philippines (October 28) and Philadelphia, USA (2 April 2014).